I met Mr. Kim one dark and rainy night when I stopped at his Texaco station for gas. He saw some judo photos in my car, and we started to talk about martial arts. We wound up in the station office where he told me about his background in Tae Kwon Do. I invited him to do a demo at our annual martial arts show (Judo, Aikido, Kung Fu) at Lockheed. He wowed the audience with his focus and power. They had never seen anything like it. I brought together a small group and started the Lockheed Tae Kwon Do Club. We were extremely fortunate to have Mr. Kim as our first instructor. We learned from the expert. Part of creating a more accelerated learning system included using English terms instead of Korean, making it easier to understand the basic forms. 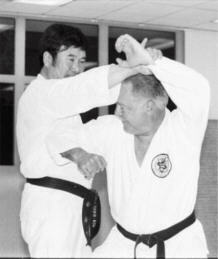 This was a switch from Judo and Aikido which use only Japanese terms. I joined the Lockheed Judo Club in 1968. By 1970 I was President of the Club, and taught judo until 1978. I Started the Lockheed Aikido Club in 1971. Then started the Lockheed Tae Kwon Do club in 1972. I Dropped Aikido soon afterward because of conflicts of time with the other clubs. Earlier martial experience was boxing in College. Thinking back on it, my earliest experience in combative arts was as a child. Living much of the time in a very small town, I learned how to fight. Despite today's laws, and the general "sportsmanlike" attitude of the public, I learned your best defense is a very strong offense. From 1988, when I retired from Lockheed, until I moved to Hawaii in 2004, I conducted Tae Kwon Do and Self Defenses classes at my home in Aptos, CA, and self defense classes for the city of Capitola, CA. Besides teaching martial arts, I also taught Proposal Management at Lockheed. Before starting a major proposal, we would train the authors in proposal writing, a specialized skill area. I am currently retired, living in Hawaii on the "Big Island". We call it that to avoid confusion because the name of the island is "Hawaii". As a member of the Board of Directors in one of the largest subdivisions in the U.S., and on the Paving Committee, I put in a lot of time working on Board tasks. I also support one of the nine members of the County Council, Emily Naeole, a pure Hawaiian, as a member of her Kahuna Council (senior advisers). There is a small branch of the Han Moo Kwon here where I practice with a former student whom I promoted to Black Belt about ten years ago. Continue to study and practice Tae Kwon Do, even if you leave the club. The practice is what matters most.